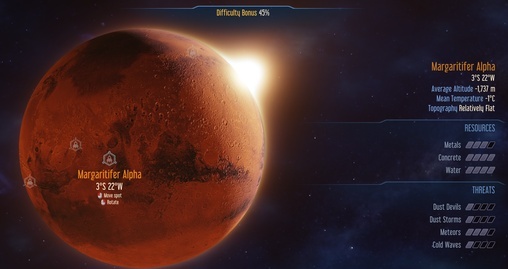 As midnight approaches on our third Sol of the Mars mission, much has been accomplished. Life support systems have been built, providing oxygen and water. Additional windmills have been erected to power those systems as well. Our research is progressing well, giving us access to more technology. A cargo rocket has been dispatched from Earth, bringing additional pre-fab structures which will give us a head start on production of basics. 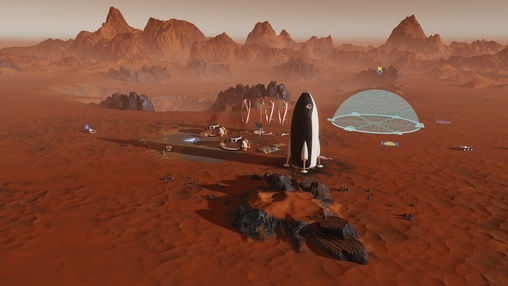 We hope that we will soon develop the technology to build these structures with the supplies we harvest and produce on Mars. The rocket is also carrying additional supplies including polymers, machine parts and electronics. We will need these from Earth until we can produce our own. 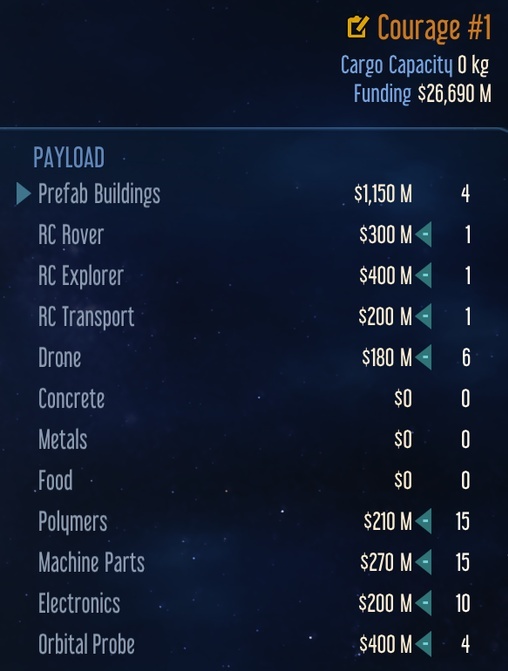 5 additional drones will be on that rocket as well. The more drones at our disposal, the more efficient building and gathering will be. HUGE discovery today. Our surface scanners have found a water deposit! It lies just a little North-West of our position. We have expanded operations with an additional concrete facility and power to support it. Research efforts continue as well. This Sol, we had our first anomaly analysed which allowed gives us a research boost of 10% for Engineering. Our scientific efforts also completed the research for three areas, Crowd Funding, Water Reclamation, and Magnetic Filtering. Crowd Funding brought us an additional 1,000 M on Earth. Water Reclamation will allow us to build a spire in domes which will reduce the water demand. Magnetic Filtering will allow the Moxies (oxygen production) to operate more efficiently giving a 50% boost to O2 production. Our efforts in construction will now have a priority in establishing oxygen and water production to support colonists. Once those facilities are in place, construction of the dome will commence. Is there a version of this on iOS? No, it's not for mobile. The first Sol on Mars saw a successful touchdown of the rocket and deployment of the rovers. Construction began with a solar array, power cables and concrete extraction facility. With an immediate supply of surface metal deposits, the rovers were able to build a power windmill before the end of the day. The Commander chose to use funding to increase research capacity from Earth, allowing an additional 2,000 research points for the next 5 Sols. With this gain in research, Explorer AI was successfully accomplished. This allows our Explorer Rover to add 100 research points to the effort each Sol. Research is a key to success. The first rocket is in the landing process, the Commander has started planning for the placement of the first dome as shown below. This area seems to be rich in surface metal deposits which will help our construction efforts. The next phase will be to set up a concrete production facility, with power, and choose our research priorities. The Colony Commander has made his decision on the landing area for the first rocket. He has chosen Margaritifer Alpha 3S 22W as the site. 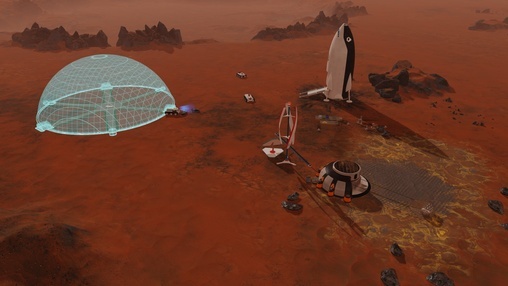 Though it has a high risk of meteors, the flatter terrain will allow for more flexibility while building domes and infrastructure. Touch down is scheduled for tomorrow morning. Mission Control Centre has ordered the launch of the first rocket containing the supplies shown below. 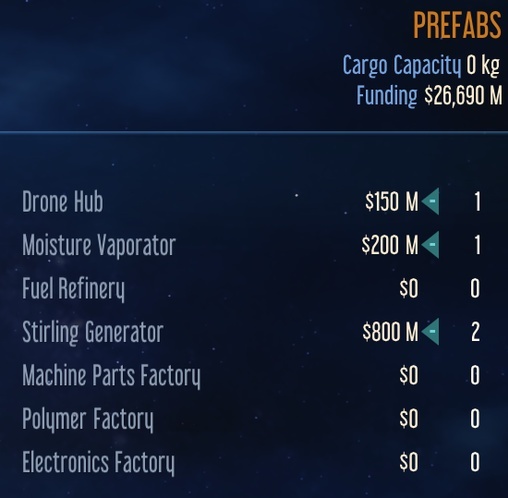 A cargo rocket with additional supplies, prefabs and drones will follow shortly. 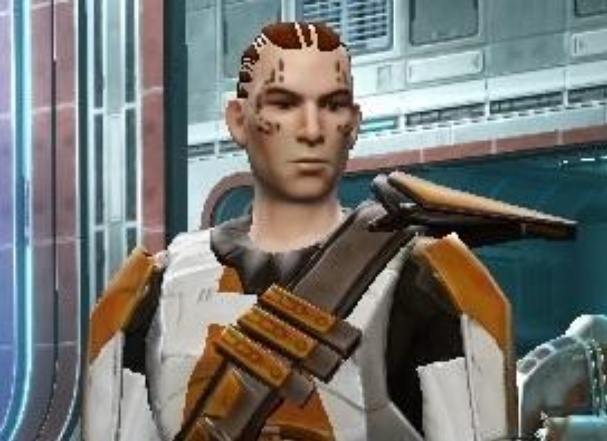 A Rocket Scientist has been chosen as the Colony Commander and will be making any further decisions about the site. MCC will fully support the Colony Commander. 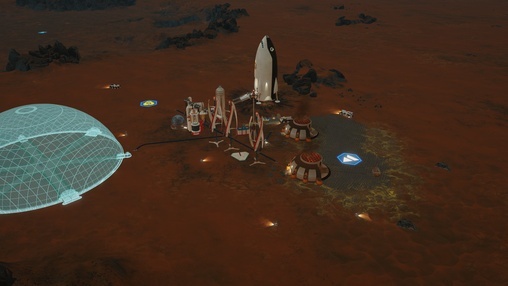 While Courage 1 is transiting to the red planet, the Colony Commander will consider the landing site choices and make a decision when the rocket obtains orbit around Mars. To aid in his decision, the Mission Commander directed the Mission Control Centre to send probes for a more information on the two landing areas. 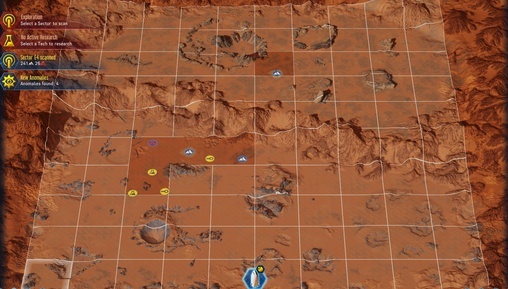 Our Mission Ops Centre has received telemetry from the Mars Survey Probes, it is time to decide our landing site. 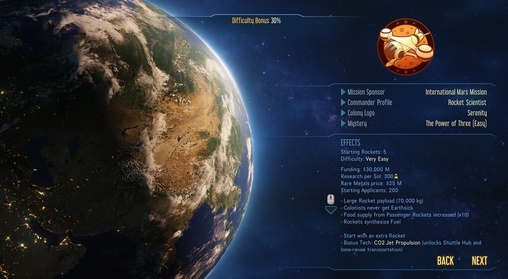 Two ideal areas have been selected by our Mission Specialists with a third as difficult reference. 1 - Coordinates 1S 167 W - very high metals available with high amounts of concrete and water. The greatest threat will be dust storms which will affect solar power generation and water production by vapourators. By using power storage cells and water tanks, the colony should be in a position to ride out the storms with little difficulty. Topography is relatively flat allowing for plenty of room to build structures. 2 - Coordinates 3S 22W - high levels of metals with very high levels of concrete and water. The greatest threat will be meteors. Though these will be pose a danger to the colony, they can be a source of additional metals and polymers with luck. At some point our scientists will be able to work on developing a laser defense against them. Topography is relatively flat. 3 - Coordinates 18N 135W - high levels of metals and concrete with a lower availability of water. Dust Devils and Storms will be the greatest threat, with an increase risk of Cold Waves. Cold Waves will freeze any stored water and shut down some production. Our scientific community will have the chance to develop ground heaters at some point which will alleviate the impact of the Cold Waves. Topography is steep and will present much less available landscape for structures. 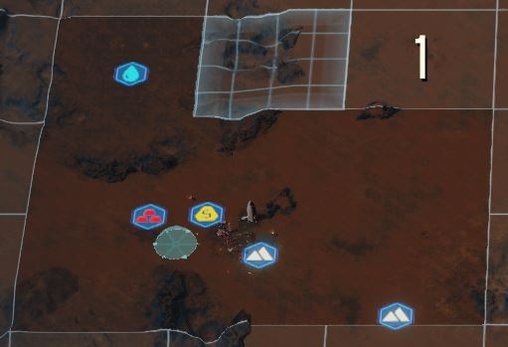 Our Mission Specialists are recommending to not choose the 3rd option due to terrain and increased environmental threats. Your assistance is requested. 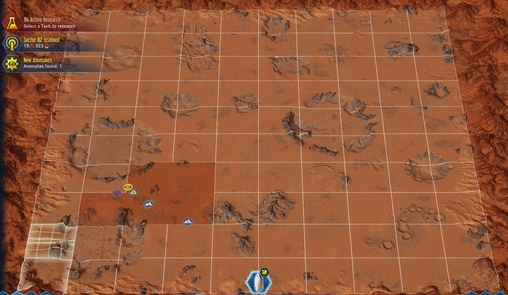 Help our Mission Commander - Site 1 or 2? 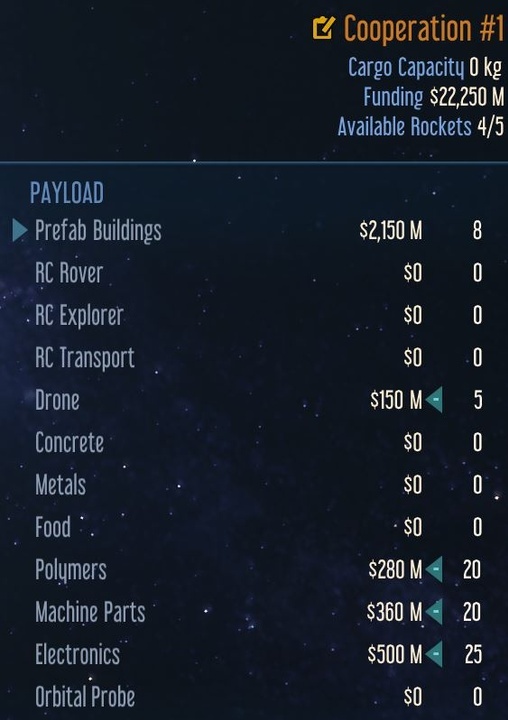 First rocket will be launched tomorrow, it will be a cargo rocket containing resources, pre-fab structures and robotic drones. 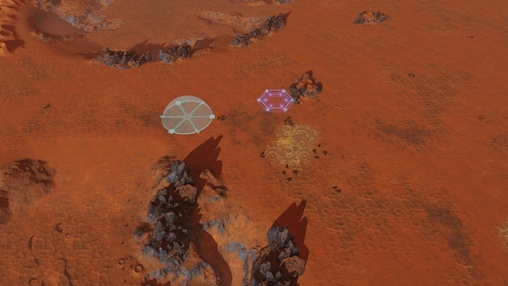 These drones will construct the necessary infrastructure to support our colonists. You have a choice of sponsors for the mission, each offering different advantages and disadvantages. 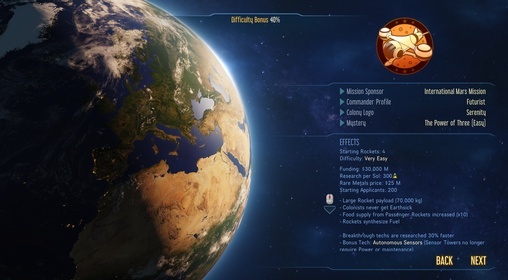 Though it is rated as "Very Easy", I have chosen the International Mars Mission. This does give the best chance of success. I may run another mission later with a different sponsor. The IMM provides $30,000M of funding which will be used for supplies, pre-fab buildings and research. It also provides additional research points at a rate of 300 per Sol which will be most beneficial. Research is the key to success and survival. The IMM will have 200 applicants for us to chose from for our colonists. The IMM will also provide food stocks with the colonists. The game update occurs tomorrow. Planned "launch" is the 26th. We have a choice in the Commander Profile which provides bonuses to game play. I have narrowed it to 3 from the many choices. Rocket Scientist, Futurist and Inventor. Rocket Scientist provides a fifth cargo/passenger rocket as well as researched tech of CO2 Jet Propulsion. This tech unlocks the Shuttle Hub and long-range transportation. Futurist researches Breakthroughs 30% faster and give the tech for Autonomous Sensor. Sensor towers will not require power or maintenance. Inventor has the drones gradually optimize through the first 100 Sols allowing faster work and construction. This profile provides the tech for Autonomous Hubs, allowing drone hubs to work without power or maintenance. Which Commander should be chosen? Hi All! 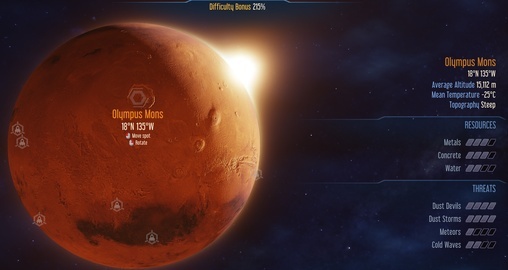 I've been playing Surviving Mars and I am thoroughly enjoying it. I plan on starting a game later this week (after a game update) and share progress on my profile here. I am hoping some of you will join in on some of the game play with me.